Plus, I’m a very appreciative poseur, which I think should count for something. After I’d liberated my ramps from their little plastic prison I sat for a minute or two or maybe ten and simply marveled at their existence. I fanned them out, breathed in their pungent odiferousness, and admired the way their pretty, pink-tinged stems curved gracefully into broad green leaves. I carefully weighed their potential as dinner against their decorative charm, savoring the visual appeal of green leaves, pink stems, and white porcelain against the dark wood of my dining room table. I got a bit caught up in the aesthetic of it all; I might have even petted the ramps a little, just to show my gratitude. Then I chopped them up and made risotto. 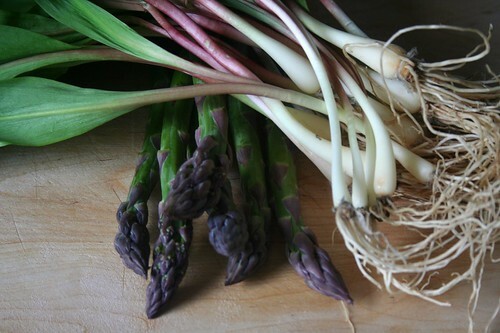 Of course, the point of this whole Spring thing is asparagus, whose tender stalks have only just begun to emerge from fertile Spring soil as if in answer to months of prayer or, in my case, whining and moping and (occasionally) cussing. And really, there’s no reason not to eat asparagus every day from now until it disappears from the local food scene for another year, so into the pan it went along with the ramps. I’m not sure a more fitting homage to Spring exists. The green grassiness of the asparagus, the spicy sweetness of the ramps and the creaminess of risotto mingle together to create a fresh, earthy dish that somehow manages to taste both delicate and piquant — a dish that quietly congratulates you for having endured months and months of snow and ice and turnips; a dish worth waiting for. Also, it’s really yummy topped with seared scallops. 1) Bring a medium pot of water to a boil and salt the water very well, about 3 T. of salt for 4 quarts of water. Trim the woody ends from the asparagus and cut asparagus the stalks crosswise into 2-inch pieces. Add the chopped asparagus to the boiling water, return to a boil, and blanch for 1 minute. Drain in a colander, refresh in cold water, and drain again. Fish the asparagus tips out and reserve. 2) Put the remaining stalks in a blender with the ice cube and blend to make a smooth puree. Scrape the puree into a bowl and set aside. 3) Bring the stock to a simmer and keep warm over low heat. Finely chop the ramp stems and greens, separating and reserving the greens for later. Heat 3 T. of the olive oil in a deep skillet over medium heat. Add the ramp stems and cook, stirring occasionally, about 3 minutes until they soften. 4) Add the rice and stir until it’s coated – about 3 minutes. Season with salt & pepper, then add the wine, stirring until the liquid has nearly bubbled away. Use a ladle or measuring cup to add the warmed stock 1/2 cup at a time, stirring occasionally until most of the stock has been absorbed. Add additional stock as each new addition is absorbed, stirring frequently but not constantly. 5) Taste the rice after about 20 minutes. When it’s almost al dente (this could take closer to 30 minutes than 20), add the ramp greens along with the last 1/2 cup of stock. Simmer until most of the stock has been absorbed, then stir in the asparagus puree, reserved asparagus tips, butter, and parmesan. Let the risotto rest while you prepare the scallops, or skip them and serve the risotto straightaway. 1) Put the scallops in a bowl. Drizzle with 1½ t. olive oil, season with salt and white pepper, and toss with the thyme sprigs. Cover and refrigerate for at least an hour, or as long as overnight. 2) Heat a skillet over high heat. Add the butter and remaining oil. When the butter stops bubbling, add the scallops and cook for about 2 minutes, until the bottoms of the scallops are caramelized. Turn them over and cook for an additional 2 minutes, then transfer the scallops to a plate. 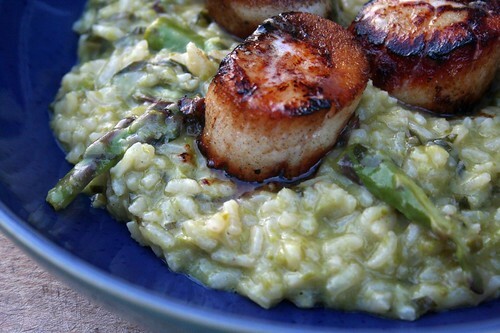 Garnish each bowl of risotto with 2-3 scallops. This entry was posted on May 18, 2009 by Megan @ When Harry Met Salad. 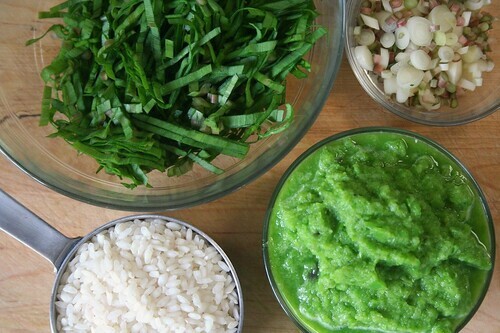 It was filed under rice & other grains and was tagged with asparagus, ramps, risotto, spring. 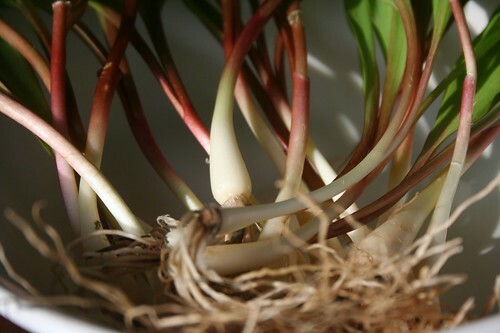 Never eaten or even heard of ramps before. You kids these days! 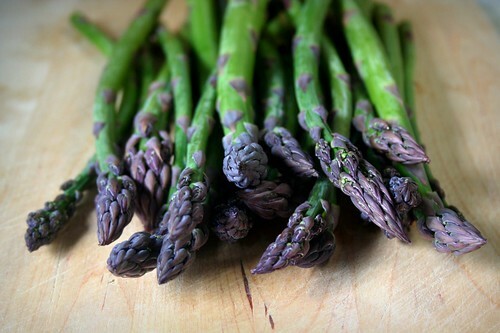 I was on board with the asparagus (love it all spring!) and the risotto though and then you threw in scallops on top and made it pure heaven!!! Dear God that looks good! I had my 10000000th cucumber of the year for lunch today. (really the only veggie you can reliably get in Dhaka). I am SO looking forward to veggies. oooh. ramps are soo great. My birthday was about three weeks ago, high morel/ramp season here in SouthEastern Ohio, so Jenna and I went a-huntin and ended up with an amazing ramp/morel/smokey cheese fritata by the end of the night. God, it was amazing, and knowing that there would not be another one like it for at least another year make it all the more so. 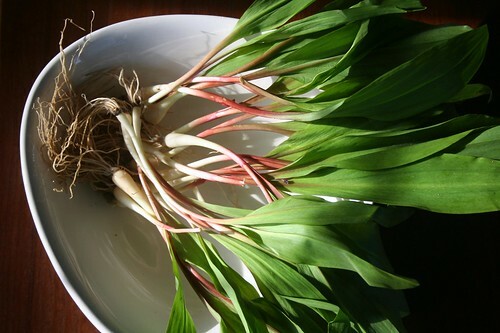 Ramps, when you find a spot, are so plentiful –hopfully you’ll get a chance to pick your own one day. I think this is your best post yet. I laughed out loud twice, and the scallops part made me say “hell yeah”. I wonder if chives can be substituted for ramps. I have chives aplenty. SC – Scallops might be my favorite seafood. . .yum! Lu – I think I’d grow bored of cucumbers pretty quickly, and I’m very much looking forward to you being home for the summer. Must plan trip to Chicago. Seriously. Send me some dates. Molly – Thanks for stopping by. Foraging (for ramps and morels and whatever else I might stumble upon) is on my list of things to learn how to do before next spring. Clare – Really? Thanks! I think chives aren’t nearly as strong as ramps, but leeks or shallots could be substituted. of msn. That is a very smartly written article. I’ll make sure to bookmark it and return to learn extra of your useful info. Thanks for the post. I’ll definitely comeback. service centres around the planet for your convenience.